Bermondsey is a London Underground station. 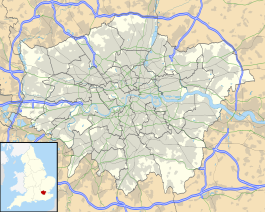 It is in the eastern part of the town of Bermondsey in the London Borough of Southwark and also serves the western part of Rotherhithe, in south-east London. The station itself was designed by Ian Ritchie Architects. Although it was originally intended to have a multi-storey office building on the top, London Underground have yet to realise the second phase of the scheme. It is on the Jubilee line, having been built as part of the Jubilee Line Extension between London Bridge and Canada Water stations. It is notable for its extensive use of natural light. The main station entrance is on the south side of Jamaica Road. The station is in Travelcard Zone 2. The station was opened on 17 September 1999. Like its extension counterparts, Bermondsey station was designed with a futuristic style in mind by Ian Ritchie Architects. Extensively using natural light, it is built in both a cut-and-cover and tube design. The cut-and-cover section is supported by latticed concrete beams allowing light to penetrate to the platform level. The escalators down to this area are lined by flat concrete with a high ceiling to give a feeling of spaciousness. The bored section is encased with metal to keep in line the futuristic and metallic theme of the extension. As with all other deep level stations on the Jubilee Line Extension, Bermondsey station has platform screen doors for passenger safety and comfort. London Buses routes 47, 188, 381 and C10 and night routes N199 and N381 serve the station. Wikimedia Commons has media related to Bermondsey tube station. ^ Horne, M: The Jubilee Line, page 80. Capital Transport Publishing, 2000. This page was last edited on 23 January 2019, at 08:34 (UTC).